I have two cats, Ingrid and Olivia. My partner and I adopted them from the San Francisco SFCA last August, when they were only 4 months old. As can be expected of kittens, they are full of energy and need to explore everything, sometimes repeatedly (such as climbing the curtains). I also dabble in Zen Buddhism. I say “dabble” since while I am drawn to Buddhist philosophy, and find a lot in it that makes sense to me and gives me peace, I don’t practice it very often, as I am just too lazy, and not all that disciplined when it comes to meditating. However, I’m searching for employment in the library profession and have plenty of time on my hands to do so. I’ve found that I can get caught up in the logistics of the job search, and the resulting anxiety. Does my resume look good? Does my cover letter look good? Did I say the right thing in my email to a potential contact? Am I doing the right things in searching for a job (i.e., if I’m looking for job postings should I be networking instead, and if I’m networking should I be doing something else)? The anxiety caused by the logistics feeds upon itself, and if not checked can lead to stress and sleepless nights. However, anxiety, stress and sleepless nights do not lead to a job. Today, I received my diploma in the mail. 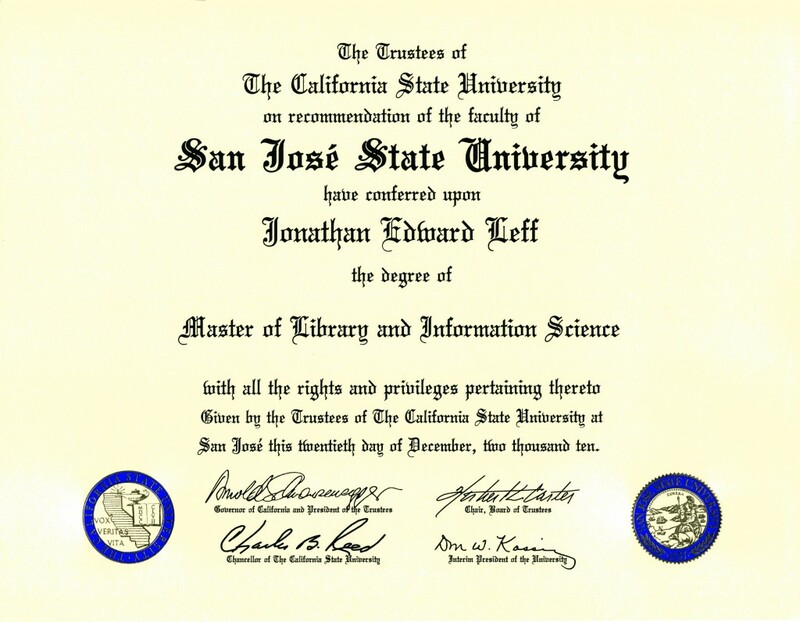 It really underscores the sense of accomplishment I feel in having completed my MLIS degree at San Jose State University. In addition to being a sign of official recognition and confirmation of my competence in the field of library and information science, it is also a reaffirmation that I can do anything I put my mind to. This reaffirmation comes at a time when I am currently searching for employment as I launch my career. The economic climate may be rough, but I have confidence that I will be able to find the place where I can make the best contribution possible as an information professional. The job search continues, but for now, I’m going to savor this one, because it feels so good.